After providing diagnoses, doctors treat patients who are suffering from diseases and injuries. Doctors are also called physicians and they can be either medical doctors (M.D.) or doctors of osteopathic medicine (D.O.). Both types of physicians use traditional treatment methods such as drugs and surgery, but D.O.s emphasize the body's musculoskeletal system, preventive medicine, and holistic patient care. Doctors can be primary care physicians or they may specialize in a particular area of medicine such as internal medicine, emergency medicine, obstetrics and gynecology, neurology, pediatrics, geriatrics, psychiatry, endocrinology, ophthalmology, or anesthesiology. Since doctors are responsible for their patients' well-being, this occupation is more demanding than most. 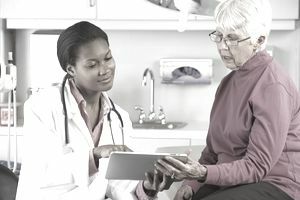 In addition to having a comprehensive knowledge of medicine, they need to be able to communicate their findings to patients who typically do not possess the same knowledge. They work with people when they are at their most vulnerable and this requires empathy in addition to the required technical knowledge. Beyond the foundational duties and responsibilities of all doctors, each specialty in the field requires doctors to be able to perform tasks specific to those jobs. Surgeons, for example, must have the manual dexterity to perform precise operations and the stamina to spend hours at a time in the operating room. The earnings of physicians and surgeons vary by specialty. After undergraduate studies, becoming a doctor typically requires at least seven years—and sometimes longer—of school and training depending on the specific career path. Education: Prospective doctors need to be accepted to an accredited medical school which typically requires completing an undergraduate pre-med program. That includes taking significant coursework in biology, anatomy and physiology, chemistry, and general science. Medical school is a four-year program. The Liaison Committee on Medical Education (LCME) accredits medical school programs that grant an M.D. degree. Osteopathic medical school programs (those that confer a D.O. degree) receive accreditation from the American Osteopathic Association Commission on Osteopathic College Accreditation (COCA). Training: Medical school is followed by a residency training program that typically lasts anywhere from three to seven years, depending on specialty. The Accreditation Council for Graduate Medical Education (ACGME) and the American Osteopathic Association (AOA) accredit residency programs for M.D.s and D.O.s respectively. In July 2015 these organizations, along with the American Association of Colleges of Osteopathic Medicine (AACOM), began moving toward a single accreditation system. This transition is expected to be complete in July 2020. Licensing: Doctors need a license from a state medical or osteopathic board to practice in the U.S. Requirements vary by state and can be found at the Federation of State Medical Boards website. While requirements vary, all M.D.s must pass the United States Medical Licensing Examination (USMLE) and D.O.s must pass the Comprehensive Osteopathic Medical Licensing Examination (COMLEX-USA). Problem Solving: After evaluating a patient's symptoms and making a diagnosis, doctors have to choose an appropriate treatment. To do this, they will need critical thinking skills to compare available options. Communication Skills: Excellent listening skills allow physicians to understand their patients' symptoms and concerns. They need superior verbal communication skills to explain diagnoses to patients and their families and convey instructions and information about treatment to nurses and others on staff. Service Orientation: A doctor must want to help people. While there are some paths available in this field that do not involve working with patients directly, most research is driven by a desire to help people. Monitoring: Doctors need to be attentive to changes in patients' conditions and respond to them appropriately. This can include anything from long-term changes in regular patients to short-term changes in patients recovering from a specific procedure or illness. The U.S. Bureau of Labor Statistics projects jobs for physicians and surgeons will grow by about 13 percent between 2016 and 2026. This is nearly twice the 7 percent growth rate projected for people in all careers, but a bit slower than the growth for other health diagnosing and treating practitioners. An increasingly aging population will drive the demand for more doctors. Few professions vary as much in terms of work environment like that of a doctor. A doctor with a family practice in a small community might have a relatively laid-back operation with a small staff. On the other hand, doctors working in an emergency room in an urban setting might be faced with extreme cases and high stress on a regular basis. Many doctors choose to specialize in a particular area which often dictates the type of environment in which they work and the amount of stress they face. Doctors' schedules can be demanding, but how challenging they are depends on their type of work. A pediatrician or a family practitioner might be able to keep more regular business hours, but a surgeon frequently is on call and often performs procedures that can go well past the eight hours of a typical work day. Before establishing a career, all doctors need to complete a residency that typically will require long hours including nights and weekends and frequent periods of being on call. Getting into medical school requires being a high achieving student and taking the right classes, including biology, chemistry, physics, and math, as an undergraduate. Training to be a doctor can take as much as a decade beyond earning an undergraduate degree. By the time medical students begin their residencies, they can start to focus on a specialty.